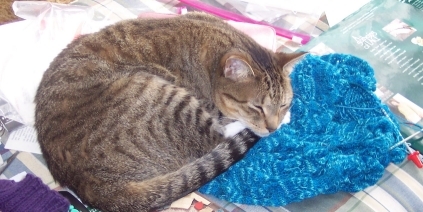 Have you noticed that most knitters have pets that feature prominently in their blogs? What would a knitting blog be without pictures of the knitter’s pets? I’ve been reading knitting blogs for several years now. Lots of knitters use them as a way to share their knitting experiences with other knitters. But I never, ever thought I’d start a blog of my own. First of all, what the heck would I write about? And who the heck would want to read anything I write, besides my husband? And then there was the prospect of having to learn the technical aspects of blogging. What has changed? Why do I now have a blog? Well, it’s a long story. I’ll try to keep it short. I got a new computer. My 7-year-old Dell Dimension had been dying a slow death for over a year. I held my breath every time I booted up. The writing was on the wall. I simply had to get a new computer, sooner rather than later, before I turned on the PC and nothing happened. So what did I, the one who didn’t want to get a new PC because she hated the thought of moving files and learning a new OS, up and do? I freaking bought a Mac. After two decades of MS-DOS and Windows, I’m now using Mac OS X Leopard. That’s crazy talk, you say. Had you bought another PC, you’d still be using an OS that is familiar. But I decided to live dangerously and be adventurous. Yes, I bought a Mac. There were a few bumps along the way. When I first got the computer in early November, I had a heck of a time trying to get the wireless Internet connection to work. It turns out that the wireless card was defective, and Apple replaced it for free. Then we discovered that our router and wireless access point weren’t compatible with my iMac, but that problem was solved by hardwiring my Mac. Then we got a TiVo and it didn’t work with our wireless set-up either. So we called our wonderful ISP, PADotNet, and replaced our 802.11b system with a faster 802.11n system. Now all our broadband electronics are merry. So here I am, with this brand new iMac, happily learning my way around Mac OS X Leopard–the X is the Roman numeral, not the letter. And I start playing around with one of the built-in apps (applications, aka programs in Windowsese), iWeb. I can make web pages, web albums, and blogs, among other things. And using a free trial account at .Mac, I can publish these things to the Internet. How can I resist? think I. And, voilà, a blog is born. I also realized that it really doesn’t matter whether anyone besides my DH reads my blog. I enjoy writing it and choosing pictures to display and I find it relaxing. There is no number two. I started the blog because, well, because I can. It’s that simple.